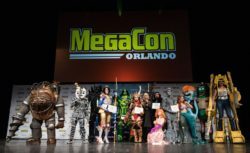 Orlando, FL – June 4, 2018 – MEGACON™, the Southeast’s largest comics, sci-fi, horror, anime and gaming event, wrapped up the Orlando convention throughout Memorial Day Weekend at the Orange County Convention Center. The four-day multi-genre convention welcomed more than 100,000 fans and included programming for all ages, a star-studded celebrity lineup and more. This year’s featured celebrity guests included Elijah Wood (The Lord of the Rings); Jeff Goldblum (Jurassic Park); Jason Momoa (DC Justice League); John Cena, Alexa Bliss, Braun Strowman (WWE Superstars); Paul Reubens (Pee-Wee Herman); Billy Dee Williams and Joonas Suotamo (Star Wars); Lucy Lawless and Renee O’Connor (Xena: Warrior Princess); Jodi Benson and Christopher Daniel Barnes (The Little Mermaid); Rob Liefeld (Deadpool and X-Force) among others. MEGACON Orlando partnered with Madame Tussauds Orlando for an exclusive first-look of the museum’s newest exhibit, Justice League™: A Call for Heroes. On Thursday, May 24, fans united at MEGACON Orlando for a sneak peek of the new Wonder Woman™ wax figure. Following this, guests were invited for an after-hours official opening of the exhibit and admission to the ICON 360 Orlando. New to the MEGACON Orlando lineup this year was Master of Cosplay Grand Prix, a new cosplay competition created by FAN EXPO HQ in 2018. Guests competed in the Southeast Qualifier at MEGACON Orlando on Saturday, May 26 for a chance to win prizes and advance to compete for the title of FAN EXPO’s very first Master of Cosplay Champion in an international finale to be held in Toronto as part of FAN EXPO Canada on Labor Day weekend. MEGACON Orlando extended the fun after-hours with a special fandom experience, Star Wars: Galactic Nights on Sunday, May 27 at Disney’s Hollywood Studios. The event brought together the Star Wars saga, a panel discussion with the creators of Star Wars: Galaxy’s Edge (a new land coming to the theme park in 2019), special photo opportunities, event-exclusive merchandise and more. Exciting new booths were packed on the show floor this year, including Jurassic Park, which allowed guests to go back 25 years and relive one of the greatest movies of all time through a tour of the iconic fictional theme park. The booth included a virtual reality headset to let guests get up close and personal with dinosaurs in their natural habitat. Additionally, other classic booths, including the Batmobile from Tim Burton’s 1989 Batman Film, Star Wars by the 501st Legion and Ghostbusters, were back for another year. Many panels and photo opportunities took place this weekend, with highlights including a signing by Marvel Comics creator Jim Lee, with a sold out presentation from Jurassic Park’s Jeff Goldblum, more than 200 cosplayers in a special Marvel Cosplay Meetup, Geek Speed Dating, Steven Universe Live Shadowcast Performance and Sing-A-Long, Phantasmagoria Performance and more. MEGACON Orlando 2019 will take place May 16 to May 19, 2019, which is the weekend before Memorial Day Weekend. For more information and tickets, please visit www.megaconorlando.com. Can’t wait until 2019? MEGACON Tampa Bay will take place September 21 to September 23, 2018. Guest announcements are being finalized right now and tickets will be on sale in mid-June at www.megacontampabay.com. Orlando, FL, January 29, 2018 – Casting has been announced for the Orlando return engagement of Disney’s The Lion King. 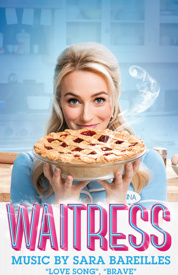 The show’s first appearance in the Walt Disney Theater at Dr. Phillips Center for the Performing Arts, and it’s third time to Orlando, the four-week engagement runs from February 14 through March 11. The role of “Young Simba” is alternated between Joziyah Jean-Felix and Ramon Reed and the role of “Young Nala” is alternated between Danielle W. Jalade and Gloria Manning. Rounding out the cast are Derek Adams, Kayla Rose Aimable, Andrew Arrington, William John Austin, Eric Bean, Jr., Kolin Jerron, Thabani Buthelezi, Sasha Caicedo, Kyle Robert Carter, Thembelihle Cele, Erynn Marie Dickerson, Tony Freeman, Mukelisiwe Goba, Deidrea Halley, Jalen Harris, William James Jr., Jane King, Gregory Manning II, Christopher L. Mc Kenzie, Jr., Nhlanhla Ndlovu, Aaron Nelson, Selloane Nkhela, Phylicia Pearl, Christopher Sams, Jordan Samuels, Mpume Sikakane, Sadé Simmons, Kimber Sprawl, Kevin Tate, Jennifer Theriot, Courtney Thomas, Shacura Wade, Zola Williams and Krystal Worrell. 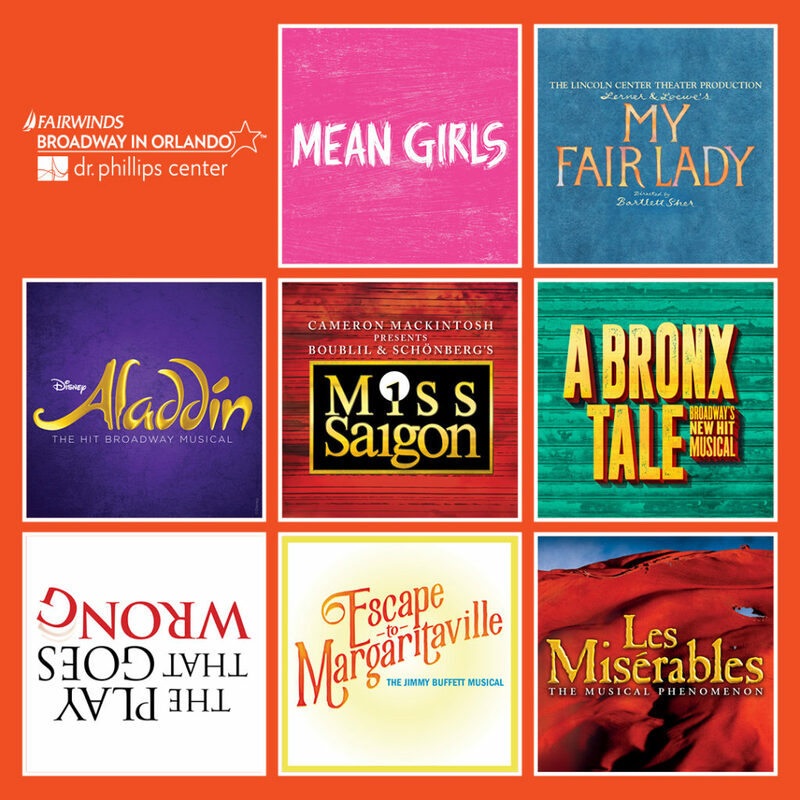 Coming to Orlando as part of the 2017 – 2018 FAIRWINDS Broadway in Orlando season tickets start at $35.25 and may be purchased online at drphillipscenter.org, by calling 844.513.2014 or by visiting the Dr. Phillips Center Box Office at 445 S. Magnolia Avenue, Orlando, FL 32801 between 10 a.m. and 4 p.m. Monday through Friday, or 12 p.m. and 4 p.m. Saturday. Online and phone ticket purchases are subject to handling fees. For groups of 10 or more please contact Group Sales at Groups@drphillipscenter.org or calling 407.455.5550. Ticket buyers are reminded that Dr. Phillips Center is the only official retail ticket outlets for all performances. Ticket buyers who purchase tickets from a ticket broker or any third party should be aware that Dr. Phillips Center is unable to reprint or replace lost or stolen tickets and is unable to contact patrons with information regarding time changes or other pertinent updates regarding the performance. The North American touring productions of The Lion King have been seen by more than 19 million theatergoers. Having already played more than 70 cities across North America, The Lion King now proudly returns to Orlando to make its debut in the Dr. Phillips Center for the Performing Arts. Dashaun Young as “Simba” in THE LION KINGNorth American Tour. ©Disney. Photo by Joan Marcus. In its 20th year, THE LION KING continues ascendant as one of the most popular stage musicals in the world. 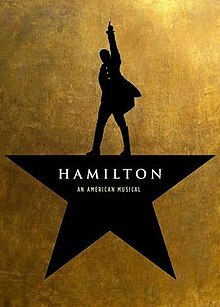 Since its Broadway premiere on November 13, 1997, 24 global productions have been seen by more than 90 million people. Produced by Disney Theatrical Productions (under the direction of Thomas Schumacher), THE LION KING is the only show in history to generate six productions worldwide running 15 or more years. Performed in eight different languages (Japanese, German, Korean, French, Dutch, Spanish, Mandarin and Portuguese), productions of THE LION KING can currently be seen on Broadway, London’s West End, Hamburg, Tokyo and Sapporo, Madrid, Scheveningen, Holland, and on tour across North America, for a total of eight productions running concurrently across the globe. 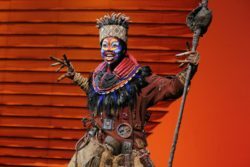 Having played over 100 cities in 19 countries on every continent except Antarctica, THE LION KING’s worldwide gross exceeds that of any film, Broadway show or other entertainment title in box office history. Broadway Across America (BAA) is part of The John Gore Organization family of companies, which includes LionKing.com and The Broadway Channel. Led by 11-time Tony-winning producer John Gore (Owner & CEO), BAA is the foremost presenter of first-class touring productions in North America, operating in 44 markets with over 400,000 subscribers. Current and past productions include Beautiful, Cats, Chicago, Dear Evan Hansen, Groundhog Day, Hairspray, Hello, Dolly!, Million Dollar Quartet, On Your Feet!, The Producers, School of Rock and Waitress. 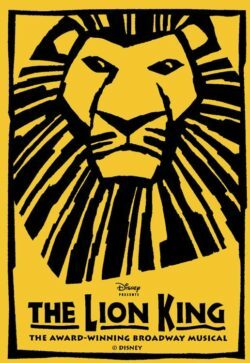 LionKing.com is the premier theater website for news, exclusive content and ticket sales. For more information please visit LionKing.com and Broadway.com. With the Imaginext DC Super Friends RC Mobile Command Center, young Super Heroes can steer the action from the palms of their hands with the remote control, sending the command center forward and in a backward turn. At the press of the transform button, the Batwing platform rises, revealing the full command center with projectile launcher, jail, and cockpit for Batman. 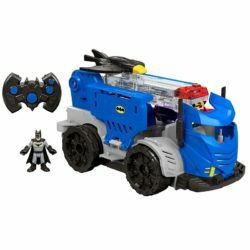 This transforming, crime-fighting machine is the perfect home base for your young Super Hero to create all sorts of action-packed, crime-fighting adventures with their favorite Caped Crusader! Imaginext continues to really impress me with their DC Super Friends line. One of their newer releases the RC Mobile Command Center is packed with features that will surely enhance your child’s play experience. From the Centers remote control action to its impressive lights and sound and to top it all of a launching Batwing! Imaginext pulled out all the stops on this one. The toy is controlled by a four button remote which has good sized buttons making easy for even younger children to use and when not in use the remote hooks nicely to the back of the center for easy storage. Some other nice details were the fold down sides which house a jail cell and an additional projectile shooter. The cockpit of the vehicle also folds down where there is a seat for the included Batman figure. Our toy tester Ian really gave the Command Center a good workout as he patrolled up and down the hallway of our house for what seemed like hours pausing only to see who he could land the launching Batwing on. (That thing really launches a good distance) From a parents point of view the toy offers quite a bit. Like all Imaginext toys the Center features a rugged build design that will survive even the roughest play. The only real drawback we could find was that once the toy is off the wheels lock which does not allow users to push the toy around freely. With the toy being a touch on the heavier side this may make moving the center a touch difficult for smaller children. That aside the DC Super Friends Mobile Command Center is a rolling, talking, lighted, launching good time that will certainly put a smile on your young ones face this holiday season. Rock and Roll Hall of Famer and former Kiss guitarist Ace Frehley made a stop at the F.M. Kirby Center in Wilkes Barre, PA on April 15th, as part of a 12 show east-coast run promoting his latest album release titled “Origins Vol.1” The night was a series of ups and downs which at one point had the near capacity crowd on their feet cheering and the next moment had them scratching their heads while leaving the theater to a slow din of boo’s. Being a huge fan of Ace I was certainly well aware of the fact that when it comes to the “Spaceman” you never know what you are going to get and, this night was certainly a testament to that. The show kicked off with the NYC based band KillCode whose modern rock tinged sound was met with a warm response from the Wilkes Barre. This could have been attributed to the fact that one of the bands guitarists was from the rural esque town or possibly that their performance was the most consistent of the night. Either way the band seemed well rehearsed and fit the opening slot well. After a brief set change and following the sounds of “Fractured Mirror” which played over the P.A. Ace and his band consisting of drummer Scot Coogan, guitarist Richie Scarlett and bassist Chris Wyse would take the stage. The group kicked off the set with one of Ace’s signature songs “Rip it Out” which gave way to several Kiss classics such as “Rocket Ride”, “Parasite” and “Love Gun”. It was at the start of “Parasite” that I began to notice that the night was in for an awkward turn. The songs tempo shifted back and forth as it seemed Ace and the rest of the band were clearly on separate pages. Thankfully after a bit of back and forth things leveled out and songs like Thin Lizzy’s “Emerald” and “Rock Soldiers” sounded great. Towards the end of the bands set Ace began to move less and less and at one point he was even sitting on one of his speaker cabinets. After a lackluster solo and his signature smoking guitar trick the band quickly ran through the Kiss/Ace staple “Cold Gin” before immediately leaving the stage. Previous shows on the tour featured a two song encore which the fans were anxiously waiting and cheering for. After several minutes the house lights came fully on and music began playing over the P.A signaling the show was over. As fans made their way out the doors loud boos and other un-pleasantries filled the air. With a set a set that ran just under 90 minutes there was certainly cause for such reactions. Fast-forward about 12hrs. to when it was announced that immediately after the Wilkes Barre show Ace was rushed to a nearby hospital and treated for exhaustion and dehydration. (As a side note the last show of the tour scheduled for 4/16 was canceled) I understand people get tired and things happen but when you are at the level Ace is at and have been performing as long as he has shouldn’t steps be taken to prevent these types of avoidable occurrences? Especially on a tour consisting of only 12 dates! This however is the typical type of Ace behavior which partly makes him so entertaining yet which has also plagued his career since his early days in Kiss. Will it ever change? That’s very hard to say. What I can say is that on 4/15 Wilkes Barre was treated to classic Ace all the way. Slipknot’s “Summers Last Stand Tour” made a stop at the Darien Lake Performing Arts Center in Darien Center on July 29th. Along with the masked 9 piece band from Iowa was Lamb of God, Bullet for My Valentine and Motionless in White. With a line up this impressive the energy outside was running high and as the night progressed each act did a great job building on that energy. Opening up the night was Scranton, Pennsylvania’s very own Motionless in White. The band performed a brief set which included songs off of each of the bands 3 albums. Though fans were still making their way into the venue those who were able to get through the slow moving security lines were treated to a solid performance by the up and coming metal band. Bullet for My Valentine would take the stage next performing a handful of songs off their upcoming album titled “Venom” in between the new tracks were fans favorites such as “Raising Hell” and “Waking the Demon” which both were definite highlights of the bands set. Virginia metalers Lamb of God were up next and instantly took the night to the next level. Flanked by large video screens and an impressive lighting rig the visual elements of the show seemed much higher than previous shows by the band. Vocalist Randy Blythe stalked the stage like a deranged psycho path stalking his next victim while spewing out thought provoking lyrics. Drummer Chris Adler laid an impressive rhythmic path which guitarists Mark Morton, Will Adler and bassist John Campbell followed beautifully. The band performed a few songs from their recently released “VII: Sturm Und Drang” along with such LOG classics as “Ghostwalking” and “Laid to Rest” with the always prevalent “Redneck” closing out the set. The band sounded and looked better than ever which made for a great show experience. Shortly after the members of Lamb of God left the stage two giant red curtains emblazoned with large black S logos would close of view of the stage. As the anticipation built so did the crowd which seemed to almost double from when the house lights first came on. Once the lights came back down and Slipknots “XIX” began playing through the PA it was on. Front man Cory Taylor dominated the stage as the band performed a variety of songs ranging from their break out hit “Wait and Bleed” to newer songs such as “The Devil and I” and “Before I Forget”. DJ Sid Wilson provided a bevy of entertainment as he jigged and shook his way around the impressive stage which included a giant devil head. Guitarist Mick Thompson and Jim Root handled the 6 string duties perfectly while new members drum Jay Weinberg and bassist Alessandro Venturella handled a fair share of the rhythmic duties which were highlighted at times by the addition of Shawn “Clown” Crahan and Chris Fehn. The band as a whole sounded better than ever and performed this night at the top of their game. With a number of dates left on the “Summers Last Stand Tour” you would be doing yourself a tremendous disservice if you don’t catch one of the remaining dates. Each of the four bands leave nothing on the table making the night worthy of the price of admission and then some. “Slava’s Snowshow” is like nothing I have ever seen before on the stage. I have seen a dozen of the Cirque du Soleil shows and since Slava is the original Cirque du Soleil clown, I knew sort of what to expect. Still I haven’t been to a show that literally it has almost been a week since I saw it and I haven’t stopped thinking about it. This award winning international clown show has been touring for 20 years and I hope it goes for another 20 years. Even though this is a circus show, it is really magical. The set is extremely simple yet so effective. There is so much done with so little. The colors are so vibrant and the use of music blends in so beautifully. Since this show is called “Snowshow”, I also expected the use of snow but never like this. Watch the 30 second clip below to just get a glimpse of what you can expect. You literally have snow exploded at you like a avalanche and it is breathtaking. Before the break, there is also a part with a spider web that takes over the entire theater. Words connect explain how terrifying yet at the same time exhilarating experience it was. to top it off it end with dozens of balls flying into the audience and the kids went crazy for that! This was the first time that I got to visit the brand new Dr. Phillips Center for the Performing Arts in Orlando, FL and it is a marvel it is own. The parking situation is not great at all though and the staff was also quite nasty and rude. I don’t just mean one person either, I mean every single employee that we encountered was unpleasant. Luckily it got overshadowed by this amazing show. If it comes to your city, I highly recommend.